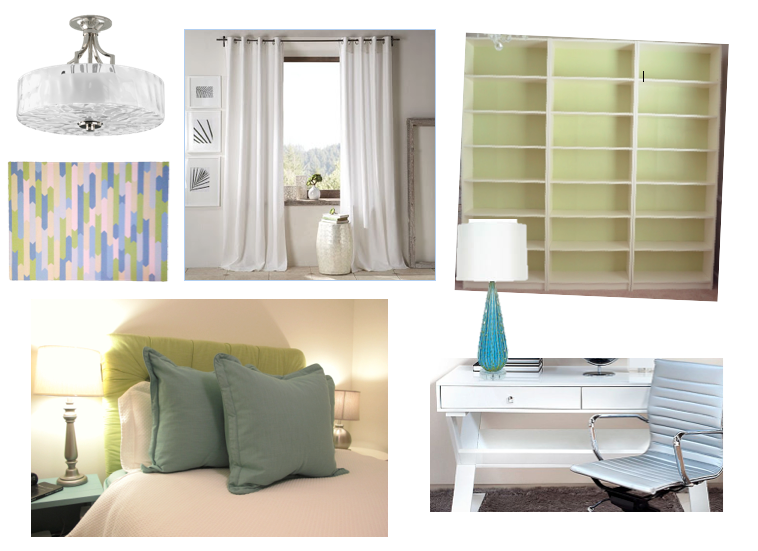 Last week I discussed the office and guest bedroom design. I featured a DIY art piece on the inspiration board. Check that out here if you missed it! Several years ago, Young House Love featured a similar DIY project and I decided it would be a fun and easy project. The colors were even similar to the colors that I needed in my guest bedroom. It took some time, but was relatively easy! I don’t have pictures of the process, but you can see this version of it with step by step pictures. Figure out what size wrapped canvas you want. Using an old wooden ruler (think elementary school teacher ruler), draw lines across the canvas and down onto the sides. Make sure to use a light pencil line if using light paint colors. Using an small envelope flap (the triangle part) you can draw “arrows” all over to create the different sections. Mix your paint colors together to come up with as many colors as you want in your painting (I have 7: white, three greens and three blues) IF YOU MAKE YOUR OWN COLORS MAKE SURE TO HAVE MUCH MORE THAN YOU THINK IN CASE YOU NEED TO DO TWO LAYERS OF PAINT OR NEED TOUCHUPS! You can tape off each section as you paint to add a crisp line. I chose not to tape off the lines so that the painting is a little more soft and organic. Paint your canvas using your different colors. I did one color at a time to ensure that the color was balanced on the painting. Once you are satisfied with the painting, use a clear acrylic sealer on it to protect it! -Design Dilemma: Where to stop a kitchen backsplash.